GoPro Hero cameras can capture professional-quality videos, for example Hero3 White can capture 1080p 30fps video, Hero3+ Silver can capture gorgeous 1080p 60fps video, Hero4 can take time lapse videos with high data rates, Hero4 Black can shoot incredible high-resolution 4K 30fps and 2.7K 60fps video and the high frame rate 1080p 120fps video. 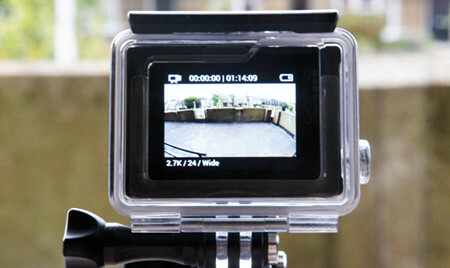 GoPro Hero4 camera can generate amazing videos with 4K resolution. Really exciting for those who like enjoying high resolution videos! When replaying GoPro Hero 4K videos on VLC player, you’re gonna suffer a big annoyance – VLC Player won’t play 4K videos smoothly and perfectly for you. Sometimes video is slow. Searching online and I got some tech support. Although VLC media player has been in support playing Ultra HD/4K videos, viewing 4K videos in VLC is not so easy as we image. The VLC player does not always work steadily when playing a 4K video for it is still in its preliminary stages. Most likely your computer is not able to process the data of the large HD video files fast enough. As we know, the majority of playback, editing work is still being finished in 1080p. In most cases, we still need to downscale most of the 4K video files to 1080p. In fact, you may not see any real differences if you’re not doing much to the footage. One of the huge benefits to 4K, that you can do a lot to the image and retain detail for a beautiful 1080p finish. For those who wanna play and edit 4K GoPro Hero4 videos on old computer (playing a 4K video requires more computing power and it could be more time consuming), we suggest you to convert all GoPro Hero 4K videos to 1080p then play in 1080p and smart-render. Although there are numbered tools and utilities can convert and compress the ultra HD videos, few of them can process at a fast speed. Well, Pavtube Video Converter for Mac (review) is considered to be the best 4K to VLC converter. It is surely in the support of compressing GoPro Hero4 4K videos to 1080p faultlessly. 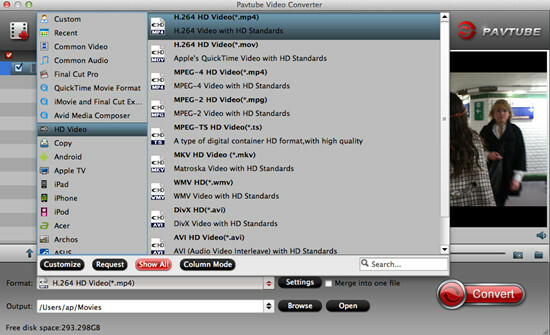 For Windows users, Pavtube Video Converter is the alternative choice. How to play GoPro Hero 4K videos on VLC smoothly? Step 2: Click the “Format” drop down list to select output format. If you want to play GoPro Hero 4K videos on VLC, you’d better set a preset profile that best meets your needs. “HD Video>>H.264 HD Video (*.mp4)” would be the best choice. Conclusion: Wait a moment, and then the conversion will be done flawlessly. After conversion, click “Open Folder” button to locate the converted video files. It would be easier for you to playback GoPro Hero 4K videos on VLC smoothly and perfectly.